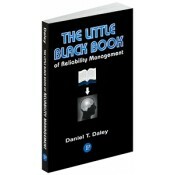 The Little Black Book of Reliability Management provides the reader with a fresh but comprehensive perspective on the subject of reliability management. It challenges the reader to consider "what he has a right to expect" based on his current reliability programs. And it describes the programs and discipline needed if the reader desires the "right to expect" a higher level of reliability performance. This unique resource is perfect for individuals working in plants and in other organizations that are dependent on the reliability of complex physical assets. • Provides much of the information needed to organize a reliability program at a company or in a plant that does not currently have one. • Features a simple description of a number of reliability subjects and techniques in a mannerthat readers can easily understand. • Describes the data that must be collected and the analysis that should be done at each phase during the lifecycle of a physical asset. • Starts the user down the path of collecting data, mapping failures to causes and implementing the elements of a comprehensive reliability program in an order that best serves his needs. • Devotes a chapter to pattern recognition and identification of the relationships between identified patterns and failures. • Contains examples of documents and spreadsheets needed to apply recommendations at the readers own plants and shops. • What do you have a right to expect?